Save the Date – Furnace Fest 2014! 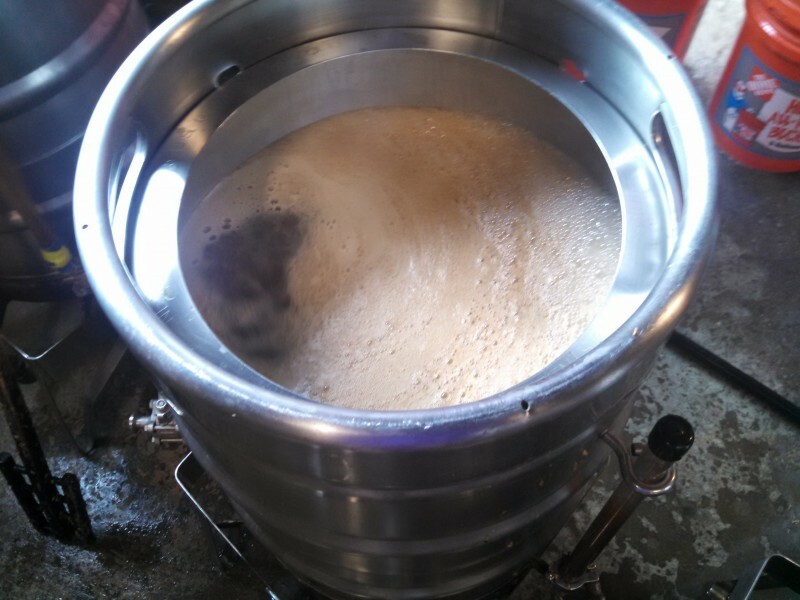 On July 10, 2014 / Newsroom / Comments Off on Save the Date – Furnace Fest 2014! In the middle of a beautiful West Michigan summer it’s hard to think about turning the furnace on – but mark your calendars for Community Homeworks’ Third Annual Furnace Fest! 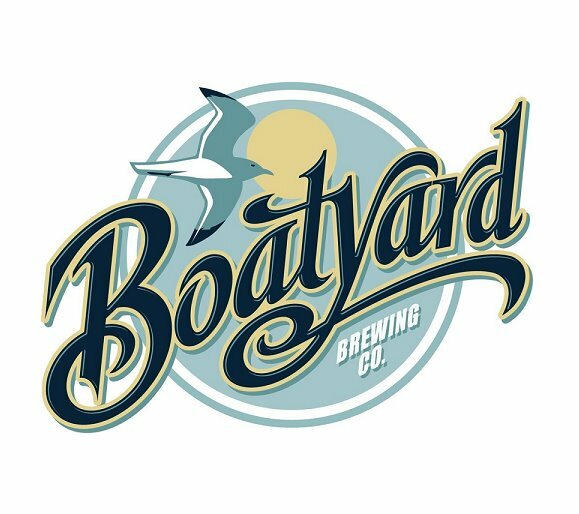 This year, we are happy to be partnering with Kalamazoo’s newest brewery, Boatyard Brewing Company! Come celebrate our 5th anniversary, get to know us and be the first to taste a special Community Homeworks beer – what kind will it be? We’ll also have some fun silent auction items to bid on and tasty eats from one of Kalamazoo’s great food trucks – we hope you’ll join us for a great evening to support Community Homeworks. Stay tuned and save the date! On June 18, 2014, a group of four nurses from Bronson Hospital’s Ortho-Surgical Unit and their family members came out to Community Homeworks’ office on Bryant St. to help beautify our block by weeding, landscaping and building a bench to go with our brand new Book Box. 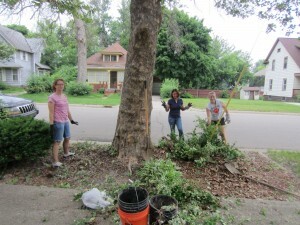 The volunteer event was initiated by Tina, who contacted Community Homeworks several weeks ago about group volunteering. Materials for the bench were contributed by the Edison Neighborhood Association’s Go Green Edison project. Although the damp weather made extensive outdoor work difficult, the group was able to do some weeding and mulching in our outdoor beds. 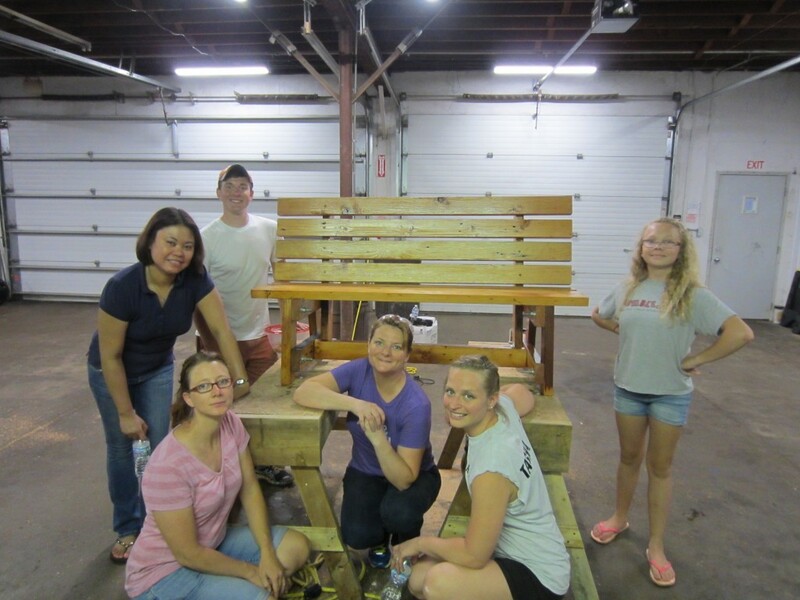 The big project was constructing the new handmade bench – using reclaimed lumber, the team got to work cutting, planing, and sanding the lumber, assembling, and applying the first coat of varnish. Thanks to Tina for her leadership in making this event happen, to Tammy for volunteering her time and construction skills, and to Teresa, Carrie, Tasha, Casey and Megan for your hard work! If you would like to volunteer individually or as part of a group please contact Emily at education@communityhomeworks.org, or call 269.998.3275 (ext. 204). If you want to build your own bench, the plans can be found here; for information on reclaimed lumber and other deconstructed home materials, please contact Tammy Wilson at the Edison Neighborhood Association. Happy June! The weather is increasingly nicer, and you can celebrate by taking care of your home! If you have a tankless water heater, clean its filter. If you have a standard water heater and have not drained it in the past 12 months, do so now. Take a bit of time to test all the shut-off valves in your home (under sinks, behind toilets, etc.). They should be easy enough to operate in an emergency. This should be done once a year. 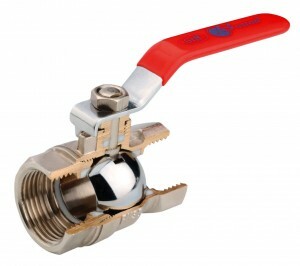 If you have trouble making the valve turn off, don’t force it—make plans to replace it with a quarter-turn or ball valve model, as these models are less likely to fail. If you haven’t done so already this year, change your lawnmower’s oil. Be sure to safely dispose of the old oil, as it is considered hazardous waste and should not be poured down the drain or placed in the regular trash. Check the hazardous waste guidelines for Kalamazoo for more information. Winter can do a number on your driveways, walkways, patios, and other concrete surfaces. 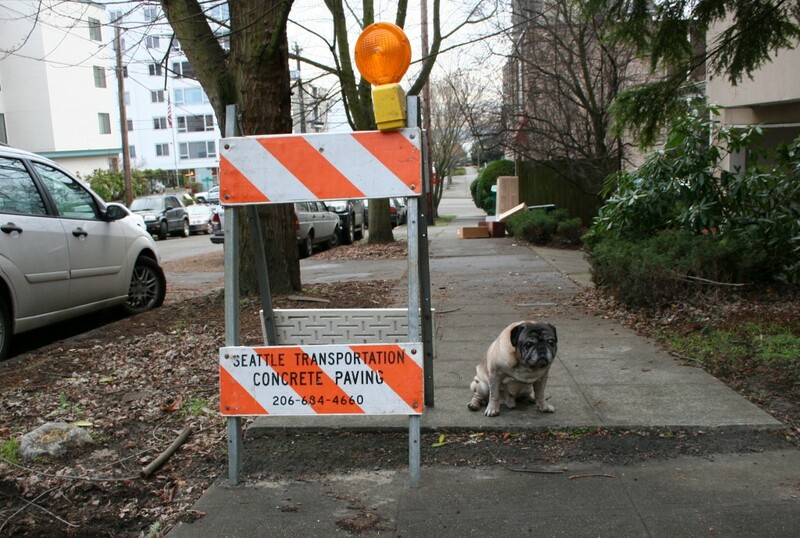 Water that seeps into small holes and cracks in the concrete freezes and expands, which causes the concrete to crack. Salt and other chemicals used to control ice can also damage surfaces. Now that the weather is better, consider taking a weekend to fix up your driveway, walkway or patio. (Public sidewalks in Kalamazoo must be repaired in consultation with the city; please call (269) 337-8601 for more information.) According to This Old House, resurfacing a 60 square foot driveway will take about an hour and cost about $25-$30; your project time and cost will vary based on the size of your driveway. We are big fans of the Edison Neighborhood Association‘s Go Green Deconstruction Project – by dismantling blighted homes with care, good building material stays out of landfills and can be recycled into projects in the community. 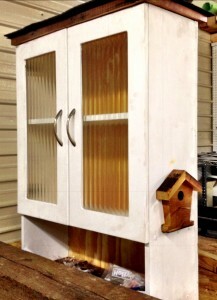 Community Homeworks is able to use recycled materials from the warehouse for repair projects for our clients and for teaching materials for our maintenance and repair classes. Kzoo.tv did a nice feature on the project, including how Community Homeworks benefits from it – check it out! We recently also participated in a fun and creative use of recycled materials from the warehouse – building little free libraries! 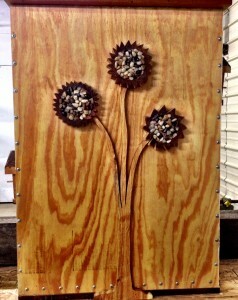 Organizations around Kalamazoo participated in the project, using materials to build unique book boxes to serve as free lending libraries throughout the Edison Neighborhood. Using a dilapidated cabinet, recycled scrap wood, and his remarkable woodworking skills, volunteer Wes Freeland produced a charming box that will soon be installed in front of the Community Homeworks office. Thank you Wes for your creativity and hard work! 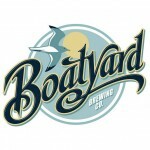 Learn more about the Beyond Books project here. KALAMAZOO, MI, MARCH 21, 2014 – Consumers Energy has recognized Community Homeworks for outstanding service on behalf of energy efficiency for a second consecutive year. The award is for unparalleled commitment to serving Michigan’s income-eligible population through outstanding energy efficiency achievements while participating in the 2013 Consumers Energy Helping Neighbors Program. Community Homeworks is one of only two recipients of the award this year and the only recipient in West Michigan. By assisting residents with home modifications such as weatherization, energy-efficient electrical upgrades, and water saving measures, Community Homeworks creates permanent utility savings for income-qualified families across Kalamazoo County. These savings can make a transformational difference in their lives by freeing up limited resources for other critical living expenses, such as food, medical costs, and school supplies. This creates a stronger community overall by fostering economic growth and increased property values. The Consumers Energy Helping Neighbors Program provides whole house weatherization, energy efficiency services and education to Michigan residents. Families working within the program at Community Homeworks could see as much as 60 percent savings in their monthly utility costs. The program is part of Community Homeworks’ comprehensive package of solutions that empower struggling families to maintain safe, sustainable, and dignified homes. To learn more about their services or opportunities to be involved, call Community Homeworks at 269-998-3275 or visit www.communityhomeworks.org. Barbara’s home in the Edison Neighborhood is nearly 100 years old. Struggling to keep up with the costs of maintaining an old and inefficient house, Barbara found her way to Community Homeworks and became part of a unique pilot program launched by Community Homeworks and Kalamazoo Valley Habitat for Humanity. In addition to receiving help with much-needed repairs and whole-house weatherization, Barbara was required to enroll in 12 education workshops. How has her life changed? Reducing energy costs and repair expenses frees up limited resources for other essentials like food, education, and medical costs. It also makes it possible to dream bigger. The knowledge and skills Barbara acquired through the workshops at CHW gave her the confidence to take on the big project of refinishing her hardwood floors all by herself. And it doesn’t end there. Barbara’s experience of translating what she learned in our workshops into real-life accomplishment made her realize she has the capacity to do even more. “I realized that I love to learn,” she says, and is beginning to work towards a degree in Business Administration at Kalamazoo Valley Community College. We can’t wait to hear more from Barbara! On Saturday, March 29, a group of 9 low-income homeowners gathered at Van Tuinen Painting in Portage for a hands-on painting workshop, part of Community Homeworks’ “Renovations and Repairs” series. Materials for the class were donated by the Edison Neighborhood Association and Van Tuinen Painting. 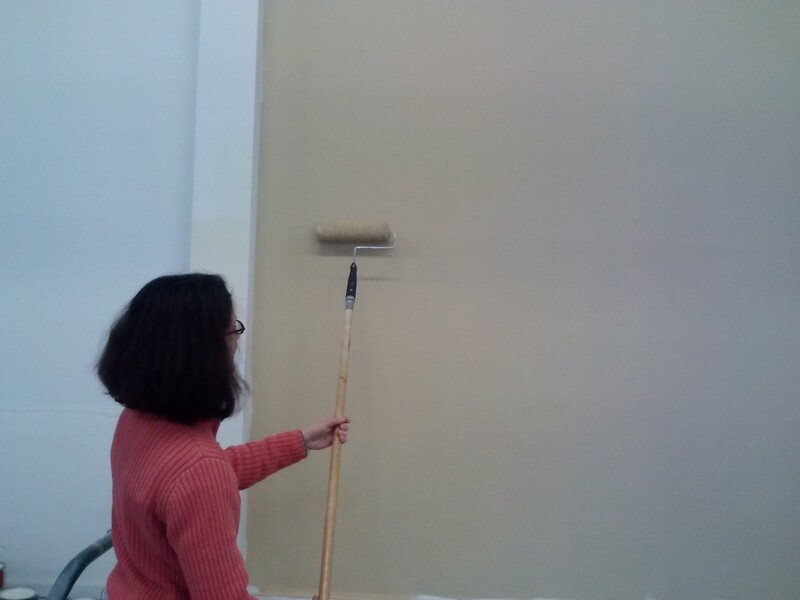 Participants learned about materials and techniques for painting interior and exterior spaces safely and effectively. Jim Van Tuinen, owner of Van Tuinen Painting, began the class with an overview of painting techniques and materials. Topics included the type of paint to use, different kinds of brushes and rollers, and ladder safety while painting outdoors. 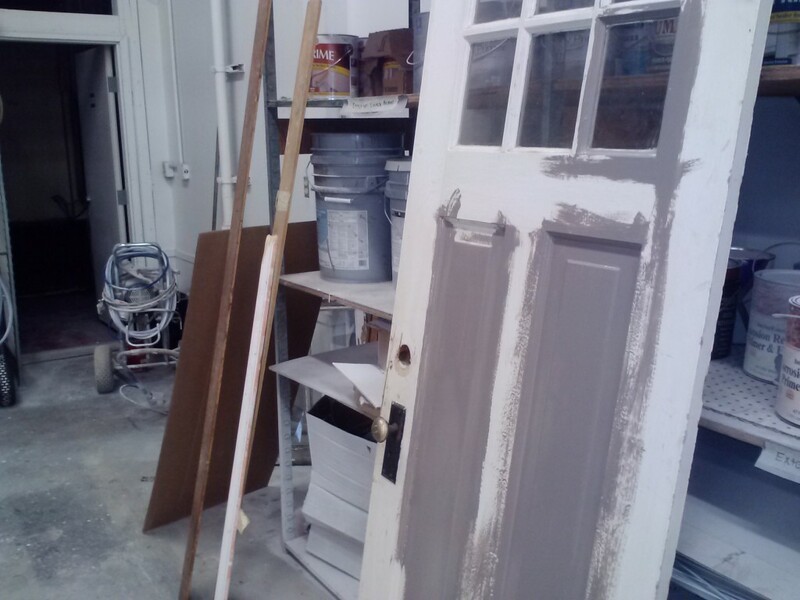 Jim then demonstrated the techniques for painting with rollers and brushes on various surfaces, including doors and window frames donated by the Edison Neighborhood Association. Participants had the opportunity to practice painting and receive feedback from Jim. The class was part of Community Homeworks’ education program, which teaches low-income homeowners the skills they need to save money and improve their homes. For more information and a calendar of upcoming workshops, visit the Education Program page. 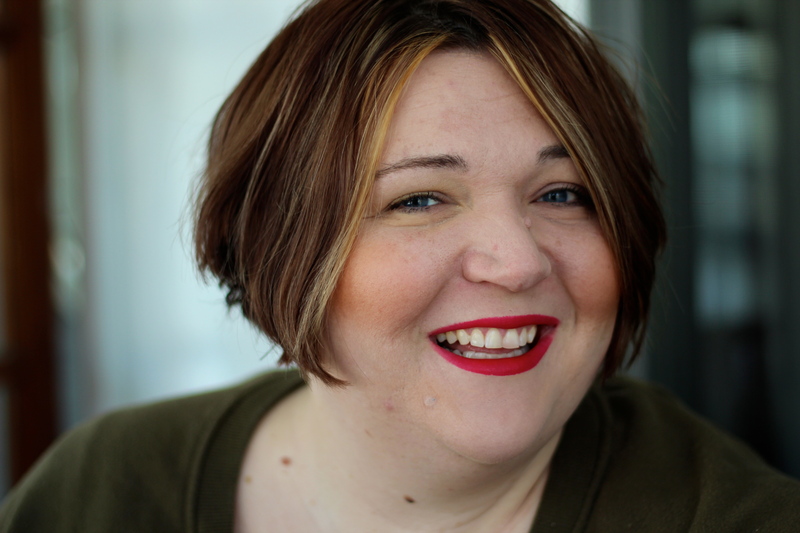 When Brandi contacted Community Homeworks in the fall of 2012, she was looking for help with some ongoing plumbing issues in her basement. Brandi had purchased the nearly 100-year-old home earlier that summer. Because the house was old and had been neglected for many years, Brandi expected there to be problems she would have to address. 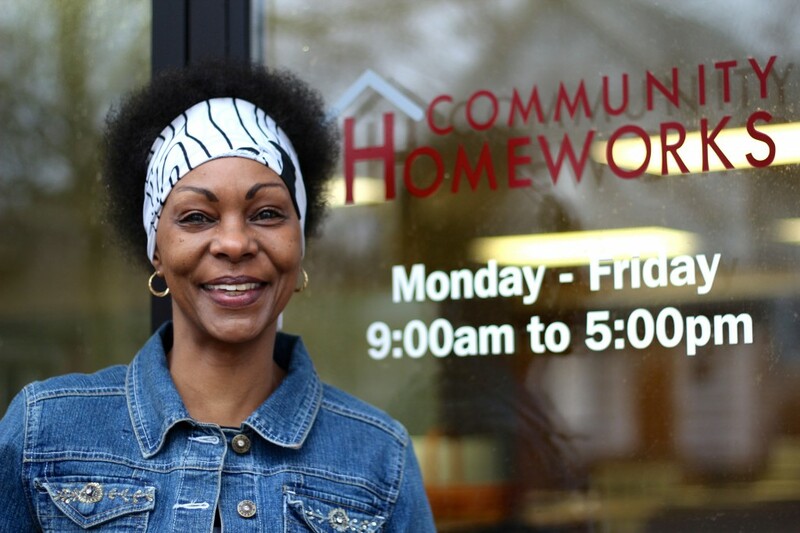 And when she ran into trouble getting the plumbing work she needed done right, she found her way to Community Homeworks through the city information line 211. When the technician from Community Homeworks arrived at Brandi’s house to take a look at the plumbing, he found a more complicated situation. Brandi had been feeling sick for several days, too sick to even get out of bed to answer the door. Fortunately, her friend was able to come and let our technician in. He noticed a strange smell in the house that was even stronger in the basement and decided to investigate, starting with testing for carbon monoxide in the air. Testing revealed carbon monoxide levels above 150 parts per million in the basement and 75 parts per million on the first floor of the house. At those levels of exposure, death can occur within 24 hours. So where was the carbon monoxide coming from? Most often, the source is malfunctioning gas-burning appliances like furnaces and hot water heaters that aren’t properly vented. So the first step in Brandi’s house was to disable the furnace and hot water heater to stop the CO levels from rising. The next step was to figure out if anything else might be trapping the gas in the house – one possible cause that most homeowners don’t think about is a blocked chimney flue. And sure enough, our technician discovered that the chimney was completely blocked by a large bird nest as well as sand that broken off from the mortar joints. Brandi had turned on the furnace for the first time earlier that week with the first cold snap of the season, but her illness seemed like just a coincidence. Once the furnace was off, she began to feel better almost immediately and was back to her normal self within a day or two. And Community Homeworks was able to repair the chimney, install a new chimney liner, and bring her furnace and water heater safely back into service, as well as make the plumbing repairs that brought Brandi to us. You can be a part of this story for countless more families in Kalamazoo – connect with our mission, donate to our work, or volunteer in our programming.